It is okay to be MEN today. It’s important that men BE men today! It’s even possible to BE the RIGHT kind of men today! It just takes some working out and working in of some important things to forge GODLINESS, MANLINESS and INTEGRITY (Christ-likeness) into all of us! This is a year-long effort to strengthen the Man we see in the Mirror every day (James 1:25). 1. Develop some manly Christian friendship amongst ourselves – we need this! 2. 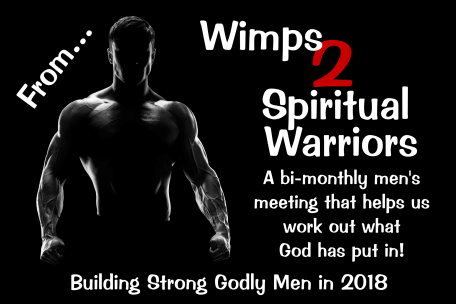 Discover Spiritual Manhood instead of only wimpy, or even angry manhood. 3. Become the right kind of examples for our children – on purpose! 4. Learn what OUR Dads probably didn’t teach us about being husbands and fathers. 5. And build Godly courage and leadership into all of us. These get-togethers will mainly be for our men from 13 years old and up, but will be open for you to bring other men along. Every get-together will have well-planned fun and super-challenging activities, but will also enable everyone young and old to add something great to their lives from the Bible. We will have good fun and great laughs as well as loads of good food – but don’t be surprised if sometimes we do some fasting! Most of the events will be free, but some will cost, and they will be more than worth it! Just make sure you come no matter what! It will usually be held in the New Activity Centre early on Saturday mornings. A Ministry of the Bible Baptist Church, Ballincollig.